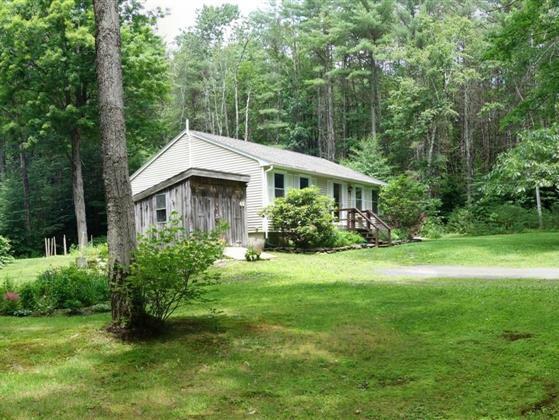 Enjoy country living in Leverett but with the availability of high speed internet! Move right into this pristine and affordable ranch, sited in a private location towards the end of a road on 3 acres. Walk trails at end of street to Chestnut Hill Loop or to Laurel Hill. In minutes you can be at the public beach at Lake Wyola , one of the best fresh water fed lakes in our area, to enjoy a swim, or you can pick up groceries and meet your neighbors at the Leverett Coop. Yet in 20 minutes you commute easily to Amherst or Greenfield. Sun bathes the house and the surrounding yard, well suited for gardens and outdoor activities, and woods provide the back border. 1008 SF comprise 2 bedrooms and bath and recent upgrades include a new roof, replacement windows, new laminate flooring and a freshly painted interior. Other amenities include a woodstove in the basement to reduce your heating costs, two garden sheds and a generator, in case of a power outage along with a finish-able basement.